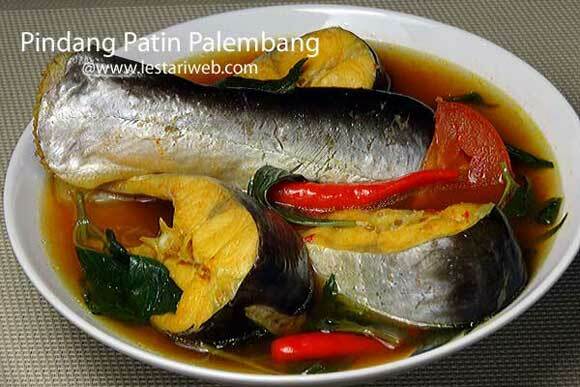 Pindang Patin Palembang or Pangasius Soup Palembang Style is one of Indonesian Traditional Culinary Icons which comes from Palembang, the capital city of South Sumatra Province. Delicious freshwater fish cooked in a light sweet, sour and spicy soup. The cooking process is quite simple and I think all the ingredients are available in almost all asian shops. If you don't like spicy just remove the birds chili from the recipe list. It tastes still good! Note: Fresh Pangasius Steak is not easy to buy here in the west but the frozen package are available at most Asian stores. And they do good enough as well as the fresh one. So for you who are fish lovers, have a nice try & enjoy your delicious Indonesian Pangasius Soup ;-) !! 2Put 1.5 liter water in a deep saucepan, cover the pan and bring to boil. 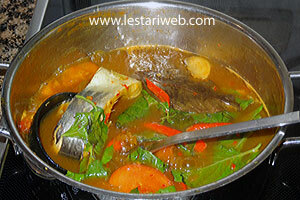 3Adjust the stove over medium heat, add the paste, lemon grass, salam leaves, ginger, galangale and bring all to boil. 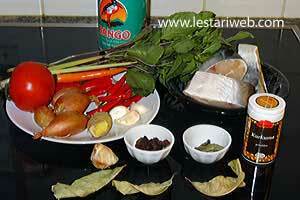 4Add the fish steak, chilies, kecap manis, sugar, tamarind water and sliced ananas (if used). Cook until the fish becomes tender but not overcooked. 5Adjust the seasoning, if necessary add salt and sugar until it tastes sour, sweet and a bit spicy. 6Add the sliced tomatoes, cook shortly until just wilted. 7Add the sweet basil dan remove from heat. Serve hot with rice.